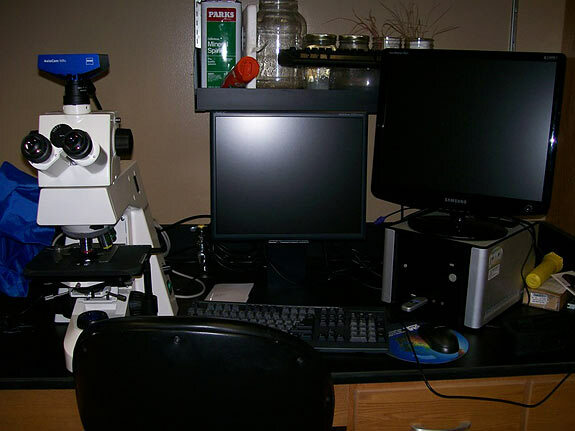 One of my favorite aspects of the aquarium hobby is that in many respects, it is a great unifier of science. Physics, chemistry, biology…all of these are involved in the creation and maintenance of a successful reef, highlighting the interconnected-ness of the sciences as a whole. In another way, aquaria unite two different aspects of biology: the ecological perspective and the microbiological side of things. One can view the aquarium – much as the environment as a whole – as a whole system or as the sum of many parts. 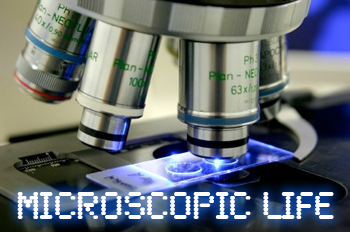 Unfortunately, few aquarists have the opportunity to appreciate their systems at the most basic level: the microscopic one. However, I have recently had the opportunity not only to see my tanks in this new way, but also to capture images to share with my fellow reefkeepers. For me, this project truly highlighted the astounding diversity of marine aquaria, not to say anything of their sheer beauty. In many ways, this “photo-essay” was an eye opener for me. It not only provides a new way of looking at my tanks, but it also taught me some things I had not considered before. 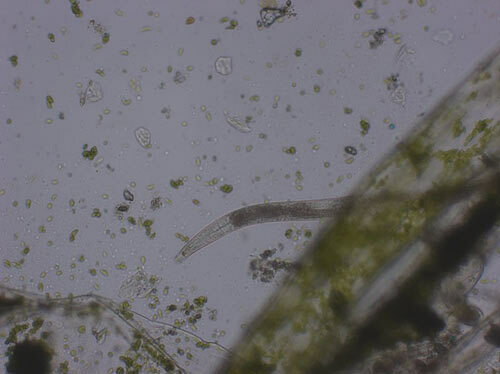 For instance, I was astounded at the sheer volume and diversity of life living on and in my algae patches… a fact I consider every time I think of algae as pests. But most of all I was struck simply by the elegance, complexity, and beauty of the oft-overlooked members of our reef communities. 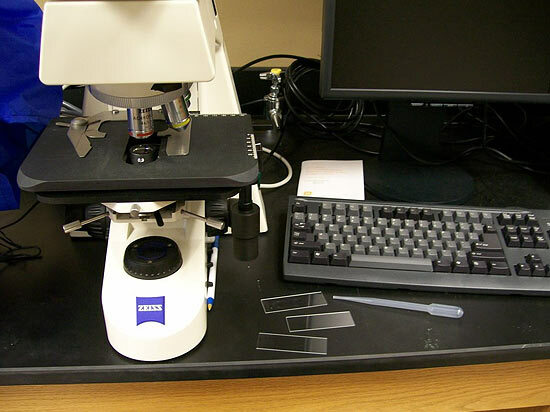 For my fellow scientists and curious aquarists: samples were collected via an eyedropper and placed on glass slides. 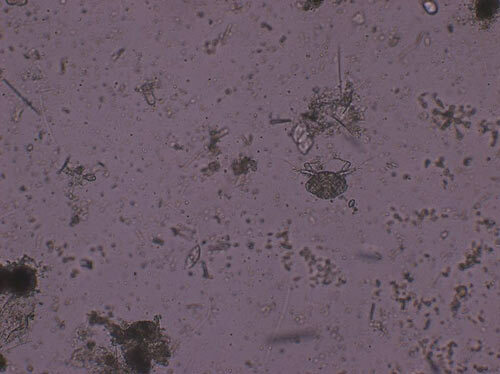 They were then examined and imaged with a Zeiss AxioCam MRc. 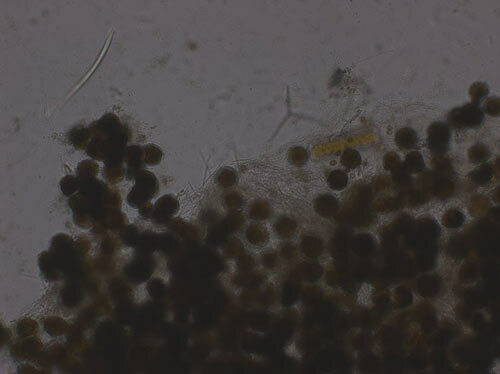 Aside from a little stirring, there was no extra preparation involved in sample collection…what you see below is the raw microscopic view of my systems (which for this essay were my 10-gallon nano and 140-gallon reef). 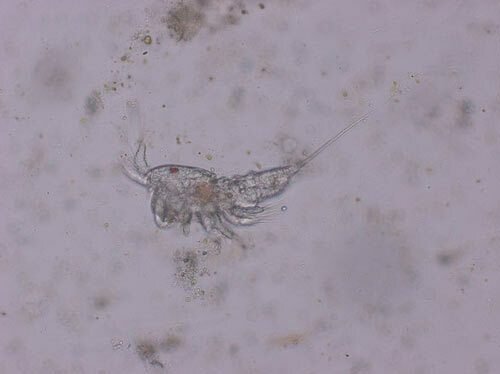 When viewed from the side, this copepod at 200x power looked ready to pounce on anything foolish enough to swim near. 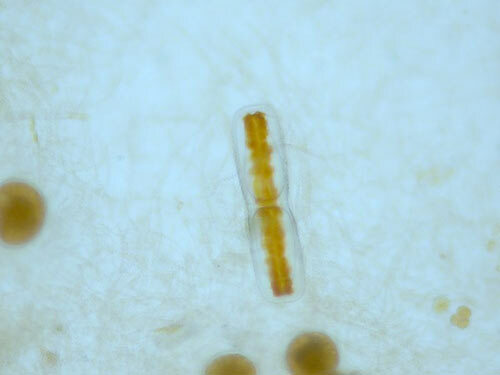 One thing I noticed during this project is that you never seem to have hair algae without 'pods...lots of 'pods. 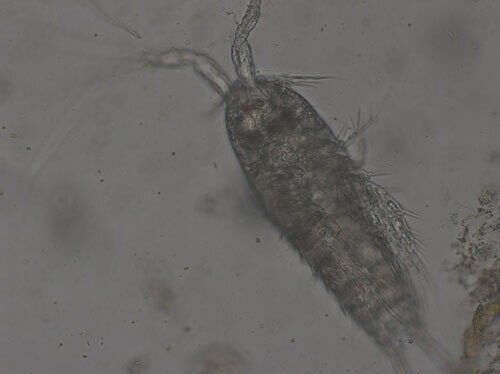 A copepod on the prowl tries to scoot away from the camera before being snapped at 100x. 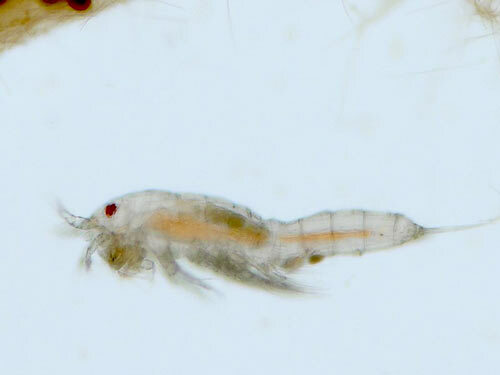 On the rare occasion that they hold still, you can appreciate how delicately constructed copepods seem at 200x magnification. 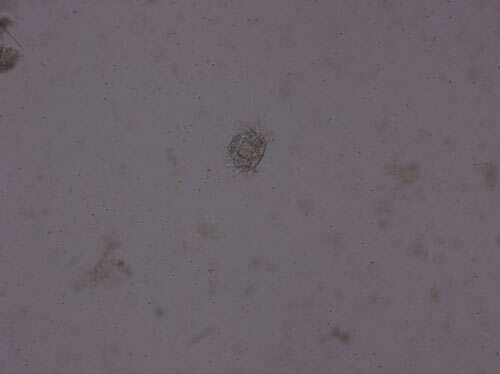 Copepod or alien mothership... at 400x, it can be hard to see the difference. Sometimes, you can forget that you're not looking at an alien world under the microscope... this unidentified arthropod looks like something out of a bad sci-fi film when seen at 100x enlargement. Another unidentified arthropod, this one looking no less foreign at 100x. 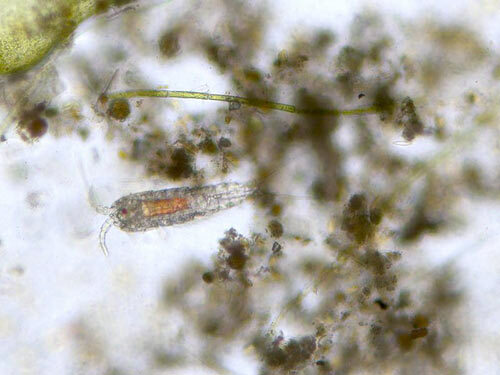 Large life is relatively rare compared to the ever-present diatoms and dinoflagellates... but it's no less impressive, as this arthropod at 100x suggests. 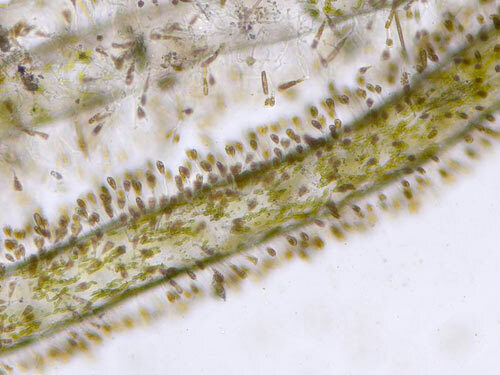 For a "pest," cyanobacteria colonies have more than their fair share of elegance, though you may need to see them at 400x to appreciate it. Another instance of a "solid" mat being much more delicate than we would think. 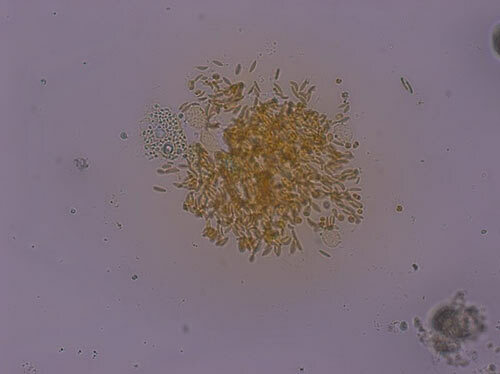 This mat has two main components, the highly scientific "blobs" and "spirals", viewed at 100x. Looks can be deceiving... what appears to be a solid mat of cyano resolves into its beautiful components at 200x magnification. 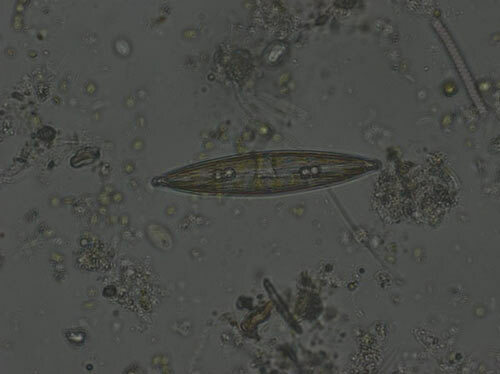 Although little more than specks or films seen under the naked eye, diatoms have some of the most interesting and beautiful architecture under the microscope at 200x. 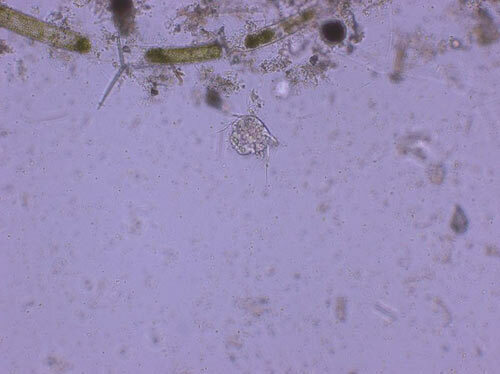 Another diatom shows off its construction at 200x. 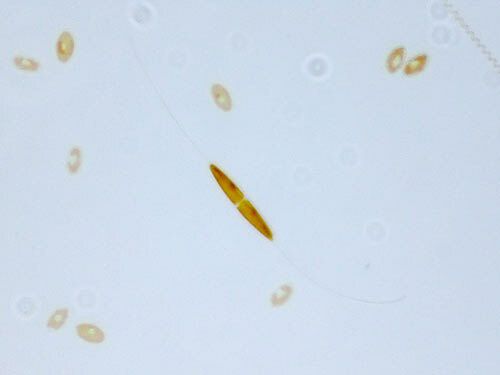 Another beautiful diatom, this one seen under 400x magnification. 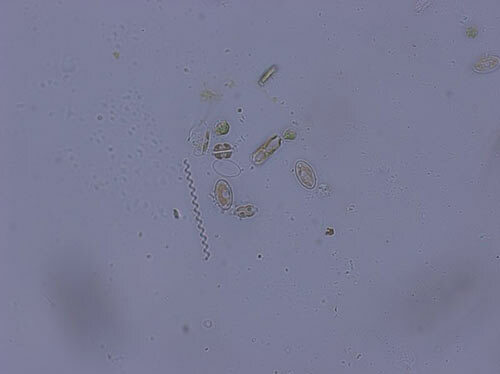 A group of diatoms at 400x really highlights how neat and organized life can seem, if you look for it. 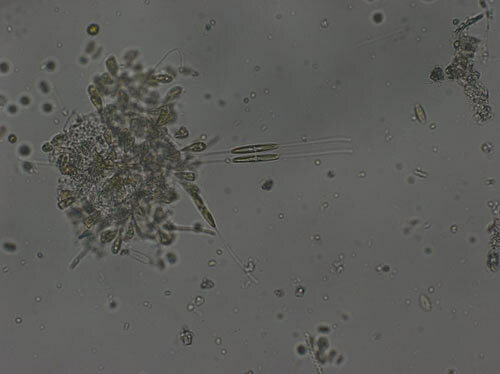 What first appeared to be a clump of debris resolved into a gorgeous "school" of diatoms when seen at 400x magnification. 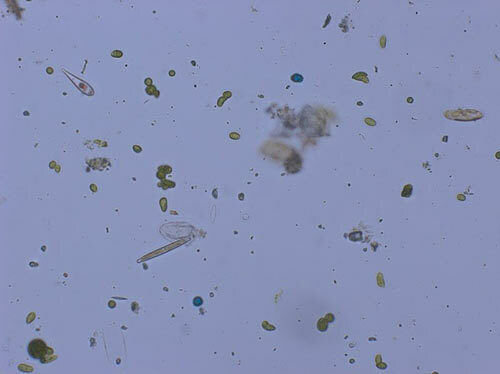 Some more diatoms show off the improbably beauty of these incredibly tiny life forms... seen at 200x. 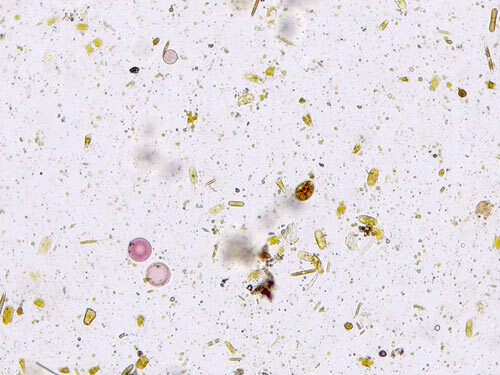 Birds of a feather flock together, and it seems that the same holds true for this "flock" of diatoms at 200x (posing as an innocuous speck without a microscope). 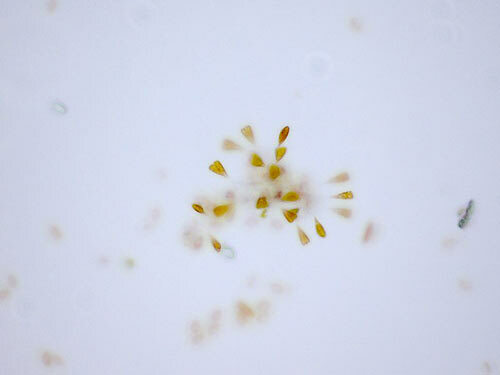 This is simply a neat picture of a group of diatoms viewed at 200x. 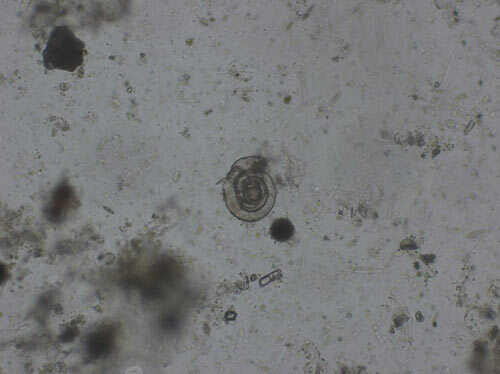 I thought I had clean water... this drop from my refugium begs to differ at 100x magnification. Who knew "dots" could be so pretty? I would like to remind everyone that there is no artificial color added here... that amazing blue is real. 200x. 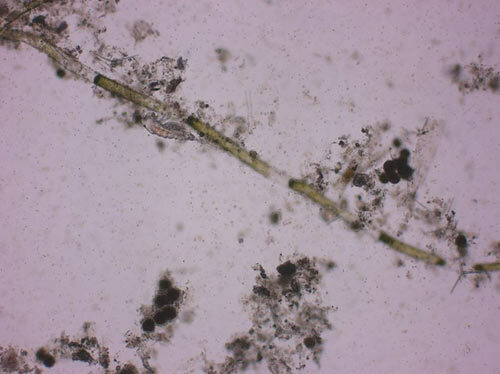 I was honestly surprise when I took note of the most numerous "large" life present in hair algae: nematodes! They are also extraordinarily active, thrashing about and making pictures very hard to obtain. But occasionally they hold still and pose. 100x. 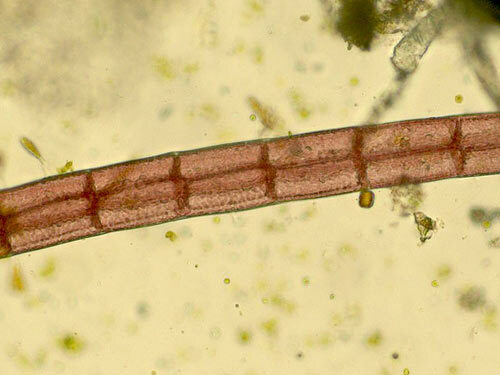 Another nematode peeks out from a "forest" of hair algae at 100x magnification. 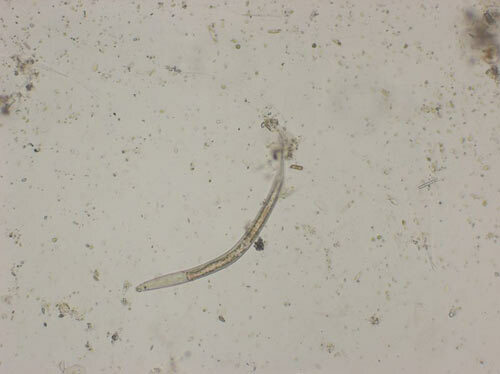 A lone nematode was caught wandering in "open water," though she refused to focus for very long... 100x. 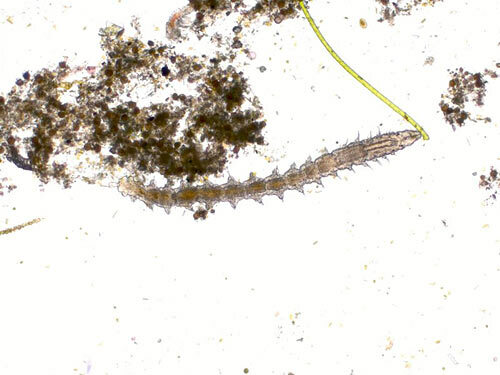 Sci-fi movie designers need only investigate the microscopic world of the aquarium to find inspiration, such as this vicious-looking worm seen at 50x. I (and the rest of the zoology faculty) am still at a loss as to what this is... it looks like a tiny snail, but it's also 100x larger than normal! 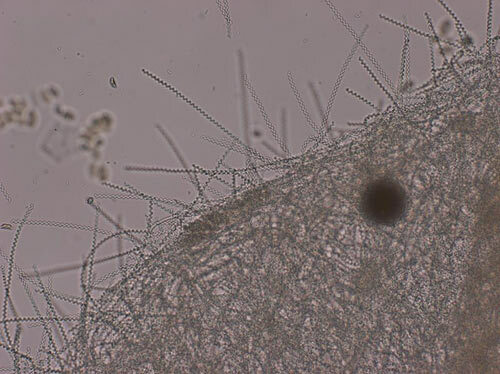 A random sponge spicule floats serenely at 400x. 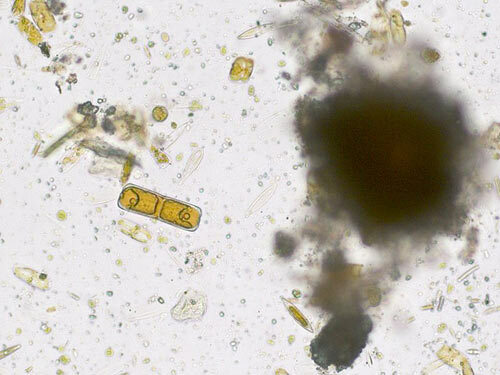 This is one of my favorite pictures... what seems to be a "straight from the textbook" collection of diatoms and cyanobacteria (the spiral) is undeniably stunning at 400x. 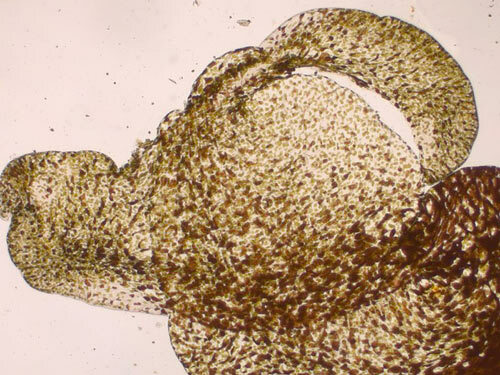 "The Blob" is actually a red flatworm... the green dots are chloroplasts and a clue as to why these things exploded under metal halides. 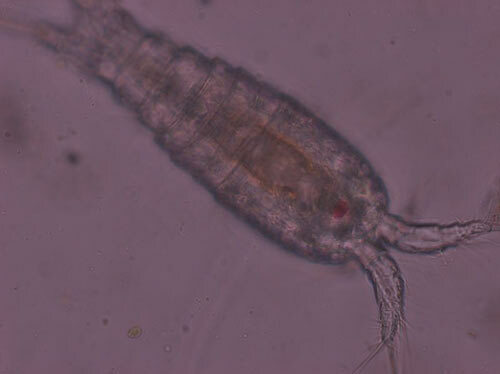 A copepod finally poses for the camera, showing at 100x how they earned the genus name Cyclops. 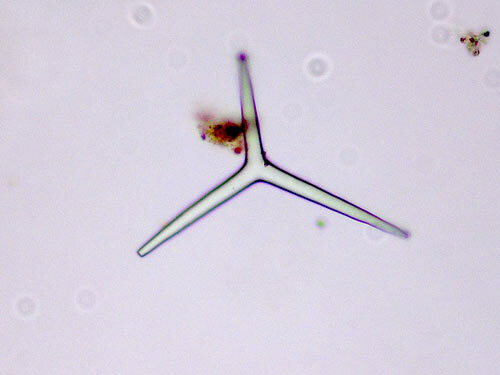 Red algae are totally mesmerizing when seen at 200x. They're not so pretty with the naked eye. 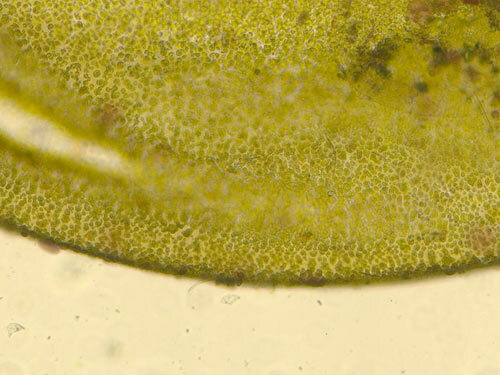 I used to think hair algae (Derbasia) was a pest, but when I saw the sheer amount of life on it, and how it looks at 100x, my heart softened a little. Who's growing on whom? 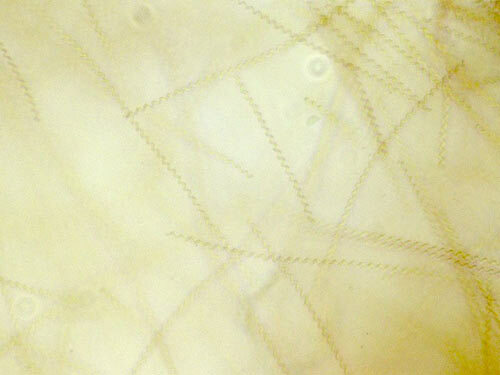 These diatoms have taken up residence on a "monster" strand of hair algae, seen at 100x. 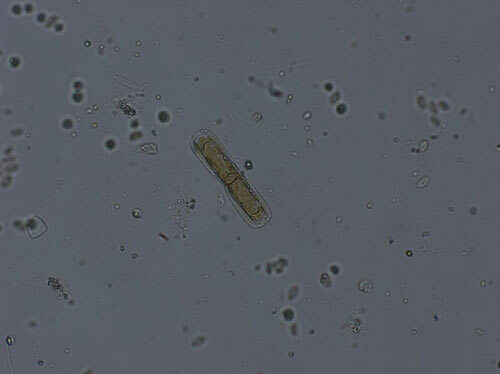 Proof of the vitality of our tanks can be seen everywhere, such as this lonely algal cell caught in the act of making itself not so lonely. 400x. 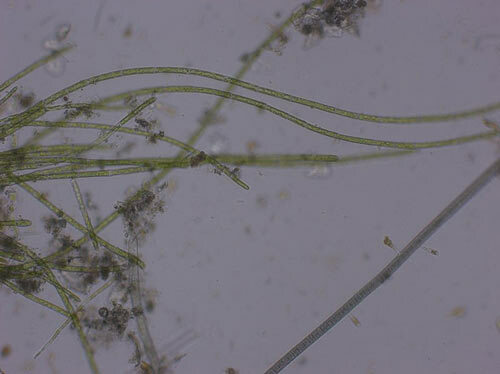 Although I've had more than my fair share of problems caused by it, even bubble algae looks gentler seen at 100x. 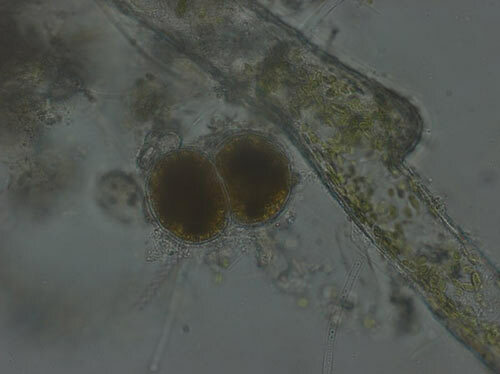 Even pest algae can take on an other-worldly beauty when seen at 100x magnification. 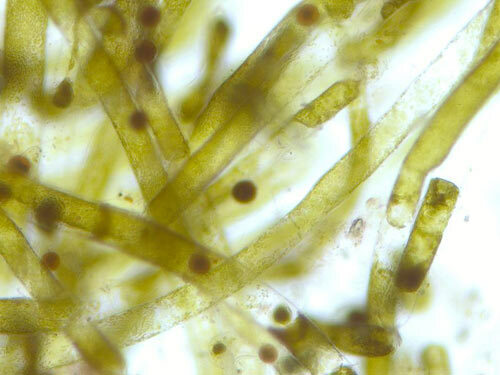 There are two species seen here: the green filaments are distinct from the blue-green filament in the bottom right. Next time you look at your tank, take a moment to consider the life unseen that makes up the 'invisible' portion of every ecosystem. If you have any questions or comments about this article, please visit this thread in the Photography forum on Reef Central.